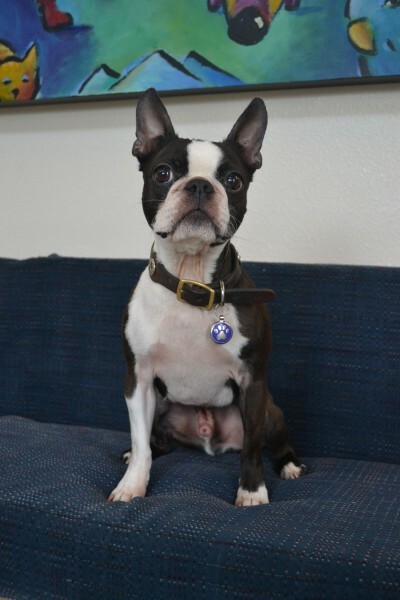 I was adopted by Dr. Hillmer and Dr. Smith when I was just a puppy and now I get to come to work with them every day. Everyone falls in love with me when they meet me. I help to train new team members too! Hmmm. I think I'd like one of the red bags and two...no maybe three...of the green. Do I smell treats to the left? Welcome to our hospital! 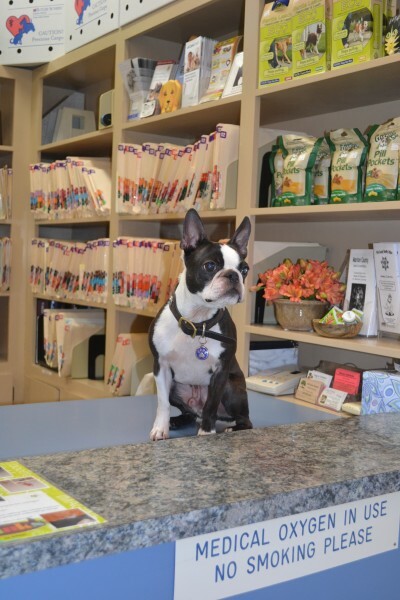 Let's get you checked in and into an exam room. Your technician will be out to greet you shortly. Nice exam room, isn't it? We've decorated it just for dogs and their owners. Now, tell me again why you need my temperature and how you're going to get it? This is our main treatment area. I'm sitting on our treatment tub where we do minor surgical procedures and dental cleanings. We use the kennels behind me for any patients who need close observation. 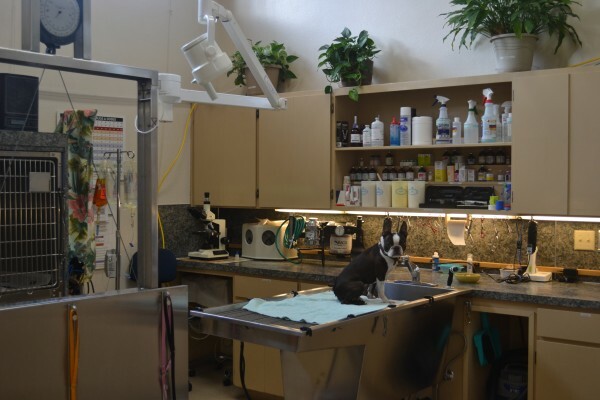 If your pet is recovering from anesthetic or is sick, we'll have him out in the treatment area where someone is always there. See! I told you I don't have your keys! I love laser therapy! It feels so good when I get my treatment. 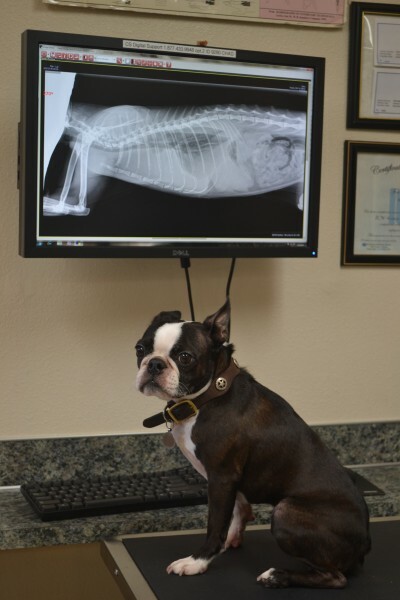 Laser therapy reduces pain and inflammation and helps to treat a lot of different medical problems. 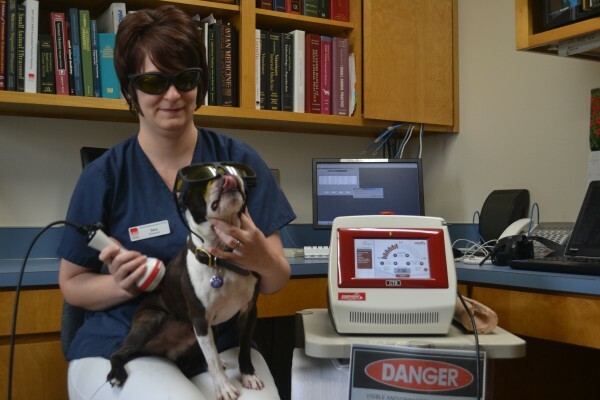 Find out more about Laser Therapy under our "Services" page! She doesn't say it out loud, but I think I'm Dr. Smith's favorite cat. So, welcome to the Salem Cat Clinic. 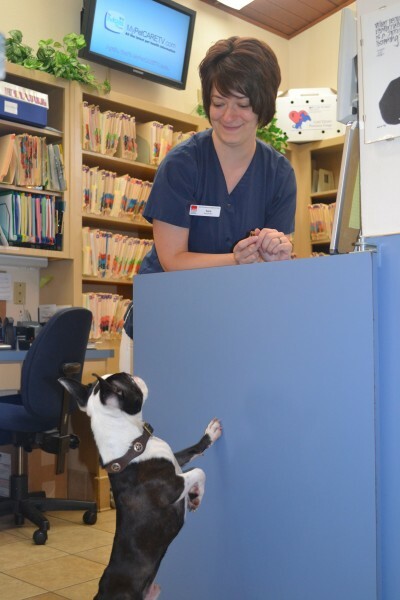 At our hospital, cats have their own entrance so they don't have to be around those nosy dogs! 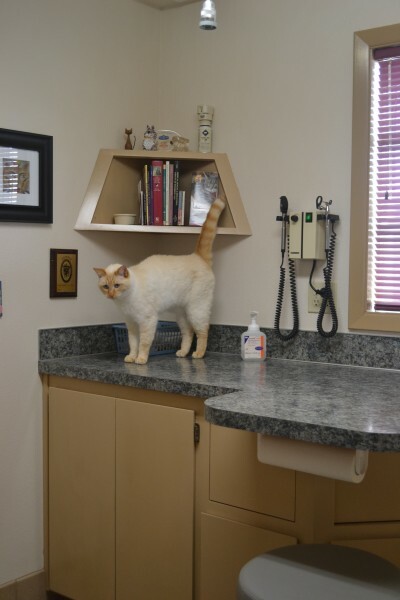 Did you know that veterinary hospitals can earn certification as a "cat friendly practice?" It's true! See the plaque above my head? 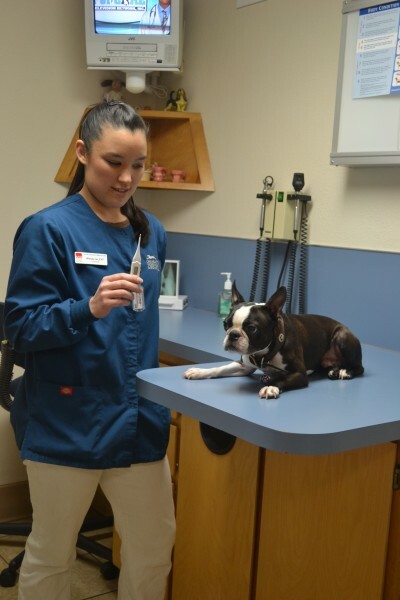 We have earned Gold Standard Certification from the American Association of Feline Practitioners in their Cat Friendly Practice Program. We use low-stress handling techniques and an understanding of feline body language, as well as appeasing pheromones, to keep vet visits calm and stress free for your kitty. 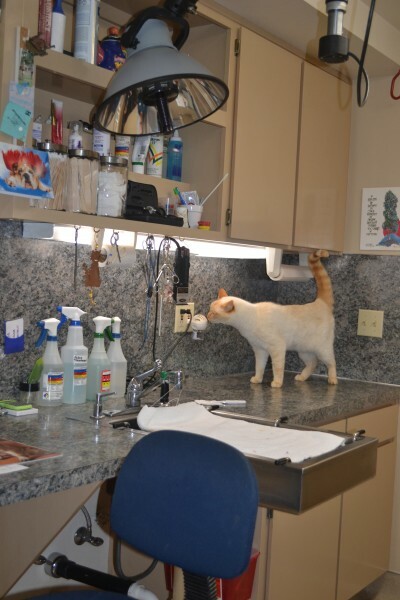 Cats have their own exam room at the Salem Cat Clinic. It's the only exam room with a window and a view! 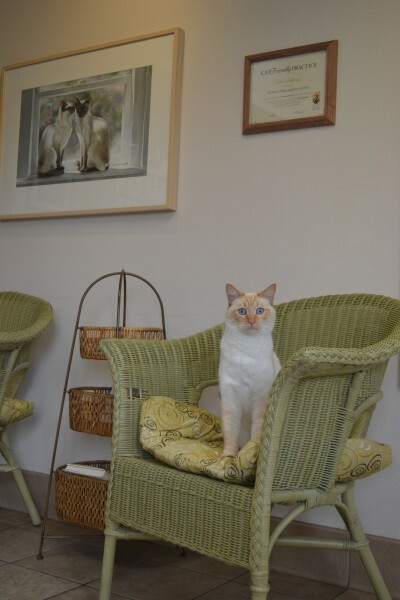 We have a special treatment area too, so cats can relax without having to be around those scary dogs. 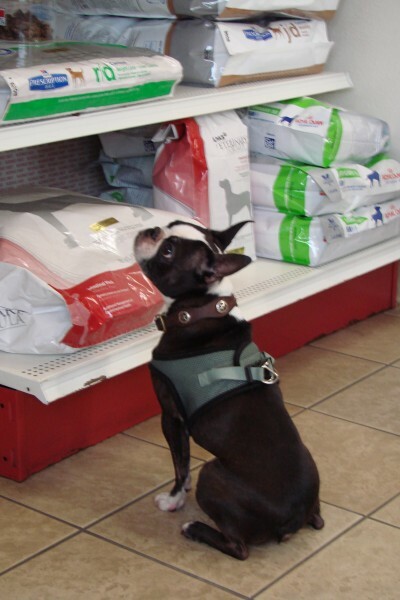 See what I'm sniffing? I love it! 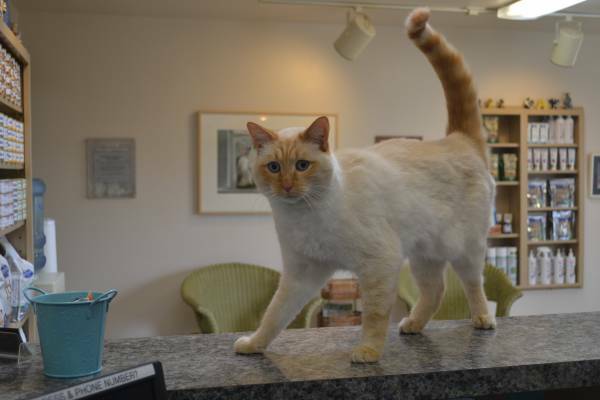 It's Feliway, the pheromone diffuser that helps cats relax when here at the clinic. 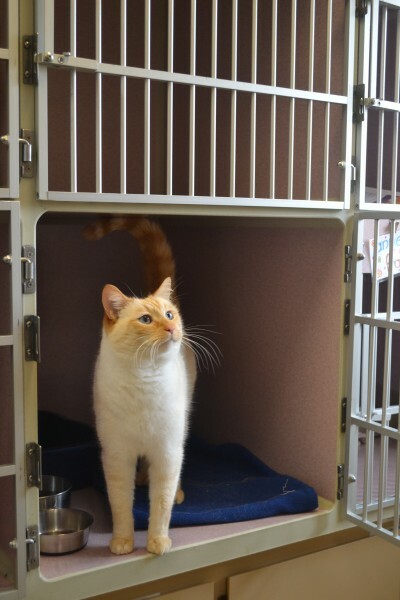 When your kitty stays with us, he'll have a cozy kennel in a room away from the dogs. It has a window too. I like to stay up high where I can look out all day. We hope you enjoyed this tour! We have an "Open Doors" policy. If you want to tour our facility in person, we will be happy to show you around! Come on in!